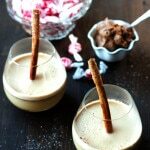 This hot buttered rum recipe is smooth, sweet, salty with a slight bite from the rum. The perfect treat on a cold winters day to warm you from the inside out. Add all the spices and sugar to the soft butter and mix well. Put the butter mixture on a piece of cling wrap and mold it into a log shape. Wrap it tightly and place in the fridge or freezer to harden. Heat some water on the stove or in the microwave. Place 1 tbsp of the butter mixture in a mug along with the rum. Once the water is hot, pour it in with the rum and butter. Mix well. You can drink it just like this or you can blend it up with an immersion blender or a magic bullet like we did. Either way is delicious! If you dont want to go through the trouble of making the compound butter, you can just put a dollop of butter in a mug and sprinkle in a bit of each spice (go easy on the cloves) and then add the rum and the hot water. Easy if you are just making one cup.